Through the online interfaces of our hotel, we continuously strive for providing you hotel services with the best possible conditions in all cases, using our customised prices. If you still find a more favourable public offering elsewhere within 24 hours from your booking, then we will obviously immediately modify our offer based on the more favourable price and send a confirmation to you. Send the information that you’ve found a more favourable price than the ones shown on our websites to the e-mail address info@s4yhotels.hu. Include the name and URL of the website containing the lower price and attach a screenshot about the offer in question. Send your booking code and data finalised on one of our websites maximum 24 hours earlier than the signalled alternative. 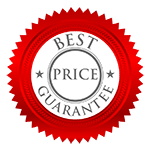 A basic condition for vindicating the guarantee is that you need to have a valid confirmed room booking from the website of the Service4You hotel or from the official website s4yhotels.hu. If the above conditions are met, don’t hesitate to write to the e-mail address info@s4yhotels.hu. The available offers and discounts are posted on the website of the hotel. Promoted discounts are always for individual bookings that is up to 5 rooms.